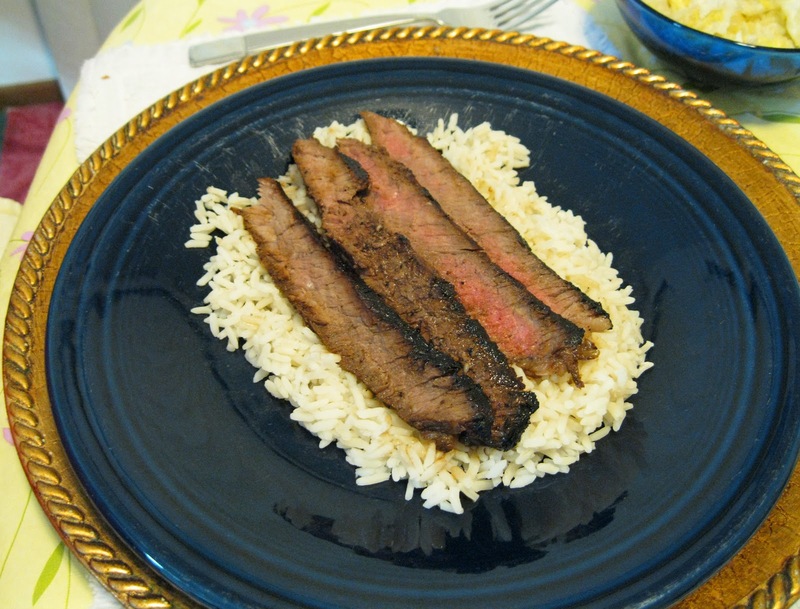 Tired of preparing flank/round steak the same way? Then you're in for a treat! * I had some confusion as to london broil so I checked and found out that this is actually a way that flank/round steak can be cooked. So even though now you may actually find steak labeled london broil, remember it is still flank or round steak. 1. In a large resealable plastic storage bag, combine all the ingredients except the steak; mix well. 2. Score the steak on both sides by making shallow diagonal cuts 1" apart. Place the steak in the bag, seal, and marinate in the refrigerator for at least 3 hours, or overnight. 3. Remove the steak from the bag, discarding the marinade. Heat a large skillet over high heat and cook the steak for 5 to 6 minutes per side for medium-rare, or until desired doneness beyond that. Thinly slice and serve. After mixing up the ingredients for the marinade, it looked and smelled so good. I had a hard time discarding it, even though the directions said to. I mean here was this great liquid with all these beautiful ingredients. I asked a friend just to confirm what I suspensioned as the reason for discarding [due to the marinade soaking up the raw meat juice and fat]. So next time, after making the marinade, I will divide it up. Most will be used to marinade the meat and the other part I will place in a saucepan, heat and use as a sauce to accompany the meat.